Offering guidance and peace of mind when executing a trust. Administering a living or revocable trust in California is much like probating a will without court involvement. While its grantor or creator is alive, they hold the assets in the trust. They can manage those assets or even liquidate the trust entirely. This is what makes the trust revocable. 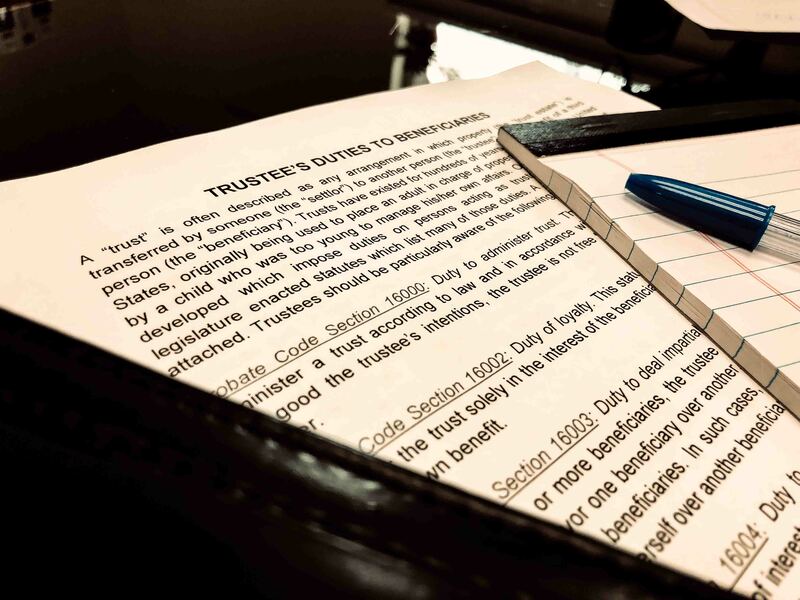 When the grantor or creator passes away, the living trust becomes irrevocable, and the successor trustee takes over ownership of the assets contained in the trust. Assets in the living trust don’t have to pass through probate because the trust itself did not die. The steps of administering the estate are much the same as when bequests are made through a will, but the court generally does not oversee the process. Administering a trust can be a complicated process. Decisions made without knowledge of legal requirements or trustee duties could be costly and prolong the process. Incorrectly administering a trust can open up the trustee to personal liability for mistakes made. The help of a lawyer can give you the peace of mind and guidance needed when working through your responsibilities as a trustee. Who should I notify about the trust administration? How should I pay expenses? How do I get a tax ID number for the trust and establish a bank account? What should I do with the settlor’s original Will? How do I prepare an inventory of trust assets or do I even need to? Can I give items away? What should I do if someone else has possession of trust property? Do I need to account to beneficiaries for the income, expenses, gains, and losses incurred by the trust? To whom should distributions be made? When should distributions be made? How do I go about closing a trust? What steps can I take to ensure I will have no more liability after the trust is closed? These are just a few of the many questions that are likely to arise in the typical trust administration context. Probate Code 16000 et. seq. **These are some great starting points, not to replace full exhaustive lists.